I've got a few fishing techniques for pre-spawn bass varied water clarity. I like to use a jerkbait like the Luck-E-Strike RC STX suspending jerkbaits. I"ve also been known to use two popular crankbaits, STORM's Wiggle Wart and Rapala's Shad Rap type lures. Historically these two lures have always been effective pre-spawn crankbaits however, I've got a 3rd lure that in my opinion surpasses both of these lures at the pre-spawn. I'm talking about the 2 1/2 inch Luck-E-Strike Freak Deep Dive crankbait and you can find it at Bass Pro Shops. True, chances of convincing Ozark angler to throw something besides a Wart are slim. You can count me in that club as wll. I've had tremendous success on the this crawfish imitation. Same is true with a number 7 or 8 Rapala Shad Rap, especiall on the Tennessee River lakes. So why would I choose the 2 1/2 inch Luck-E-Strike Freak Deep Dive Crawdad crankbait for pre-spawn bass fishing? First, I like to get a Wiggle Wart lure on the bottom and slow it down, bounce through the rocks with its wide, erratic wobble emulating crayfish. Stop and go but slow. Second, I like the Shad Rap for its tight wobble, and I work it with medium to fast sweep of the rod allowing it to stop and pause similar to a jerkbait. Both are great cold water techniques. Keep in mind the Rapala Wart can't be fished fast unless you are a master at tuning them and the Shad Rap is more of a shad lure not a crawfish one. Well, the Luck-E-Strike Freak can do both techniques. The Luck-E-Strike Freak has a faster angle of decent than the Wiggle Wart or the Shad Rap. It gets to the bottom quicker and stays there longer. This Luck-E-Strike Freak crankbait hangs up less when coming through wood or most other complex cover. I can owrk it fast like a Shad Rap with a tight wobble or I can get it on the bottom quickly. With its unique square bill, it will bounce erratically off the rock and gravel bottom like a Rapala Wiggle Wart. #1: Visualize: Picture the water depth the bass are using. This is key because you do not want to be working your bait below the fish. It is much more effective when the bait stays above the fish. Depending upon the water clarity, I'd be trying to keep this lure on the bottom in 10ft. of water or less. #2: Add Suspend Stips: I like to use STORM Suspendstrip weights. I want to get the Freak crankbait down the stop it and pause it much like a jerbait. Then, you'll sweep it 2 to 3 feet and pause it agan. This is the retrieve method that I prefer, especially in cold water with temperatures in the mid 40 to low 50 degrees. If the water temperature is in the mid 50 to low 60 degree range, I will do what I call a short burn. A short burn is where I make a long cast and when I'm at the bottom or near the bottom I pause and then burn with a 6:30 reel for a short distance, about 1 to 3 feet and pause again. Recommended Rod and Fishing Line: Use a 7 ft. Bass Pro Shops Crankin' Stick Casting Rod, medium heavy, with 8 to 12# Bass Pro Excel mono line. Recommended Hooks: Upgrade your front and back hooks from #6 to #5 or ‪#‎4s‬‬ round bend hooks. Rick Clunn is a member of the NITRO pro fishing team and a 4 Time Bassmaster Classic Champion. Rick Clunn is a professional bass fisherman from La Porte, TX who currently resides in Ava, Missouri. 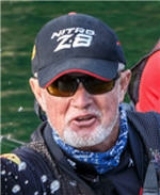 He is on the NITRO Boats Pro Team and on the Bass Pro Shops Pro Staff and has fished professionally for over 40 years. Rick was the first angler to win a million dollars in competitive bass fishing. 1976,1977,1984, and 1990 Bassmasters Classic World Champion. 1988 B.A.S.S. Angler of the Year. 28 consecutive years qualifying for the Bassmasters Classic World Championship. 1st Angler to win a million dollars in competitive bass fishing. 14 B.A.S.S. National Championship wins. Holds the Bassmaster Classic World Championship all-time catch record of 75 lb 9 oz. FLW Champion Ross Barnett, Mississppi Feb. 1997. FLW Champion Beaver Lake, Arkansas April 2000. FLW Champion Pickwick, Alabama Lake June 2000. All-Time leading money winner FLW Tour, over $700,000. Inducted Bass Fishing Hall of Fame 2001. Inducted Freshwater Fishing Hall of Fame 2001. 2002 B.A.S.S. Central Open Sam Rayburn Champion. My answer is, “Live your dream!” No matter what it requires, you must be true to your self. Whether it translates into honors and awards must be set aside. Whether you have the approval of others must be ignored. Being happy and in harmony with the rest of creation comes only when your pursue your heart felt dreams. Real dreams are dynamic. There is no final destination. It is more accurately a continuous journey where you experience your higher self in the most intimate way imaginable. You realize your dream is your vehicle to search for perfection. It is your art form, which gives you the creative ability to give back to creation. My angling journey has been my greatest teacher. It has become my infinite quest to reconnect with the wonders of creation. Creations greatest gift was our creation. Our greatest gift in return is to fulfill our creative potential.